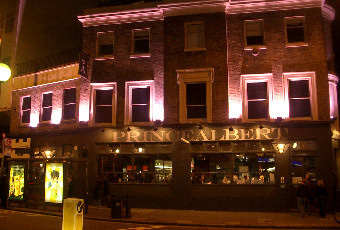 With just time for one last drink before getting the tube to Stamford Bridge, I made my last stop the Prince Albert, just at the bottom of Portobello Road. It's predictably an attraction for tourists. So it seems to attract a transient crowd. But I finally managed to get a seat. So I felt a bit more at home. Ales were London Pride, Ubu & Monty Python's Holy Grail. With still no dark beers in sight, I decided to go for a craft cider from a can in the fridge. My hopped cider with mimosa scarcely got me any change from £6. I won't be having that again! Bless me father, It's been 18 months since my last review and NOTHING has changed ! Still love the place, the view, the crowd - but the lazy, ignorant, incompetent and rude staff really need to shape up. Imagine the worst case of carbed up, burger overloaded, sluggish, rude and totally useless person who looks like they need a shower ? Then say hello to your bar person ! 'Could do better' as my old maths teacher used to say. Is an ok place, but I often get made to feel like I am scum by the bar staff. Average beer selection, decent enough menu. The pub is alright (though nothing to really write home about) but it's ruined by the service. Inattentive, slow and not exactly charming, and reading the reviews this has been a problem for some time. It's a shame, as the pub has a pretty good location and could be improved a great deal with high class service, but thanks to the experiences I have had there, I won't be in a hurry to return to find out if it's changed for the better. Really nice pub, lots of places to sit, good outside area, nice crowd, wide selection of beers and drinks, food too (although I was just staring at others!) but the staff are useless and lazy, no idea who is next to be served, miserable and aggressive. It takes them ages to serve, so even though they could be just one person ahead of you you still wait ages, usually because they serve someone who came to the bar after you but if less of a waddle for them to reach. If you can't be bothered to smile at your punters find a different career path.